When we had our first baby we were living in a one bedroom flat. Patrick didn’t have a nursery, he had a ‘corner’. 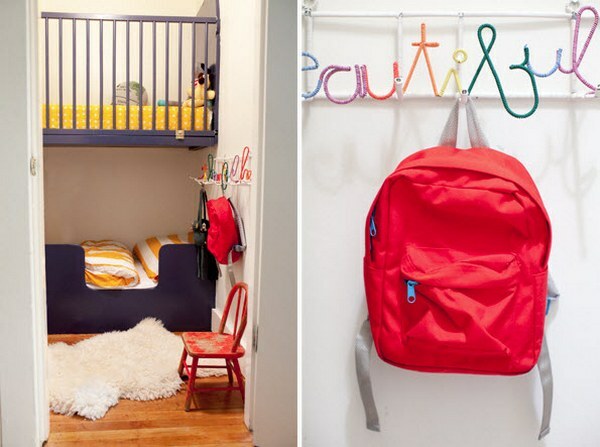 These clever parents created a nursery in a cupboard. Yes, a cupboard. As mother Jordan Ferney notes, Harry Potter also lived in a closet and he grew up to be a fine young man. 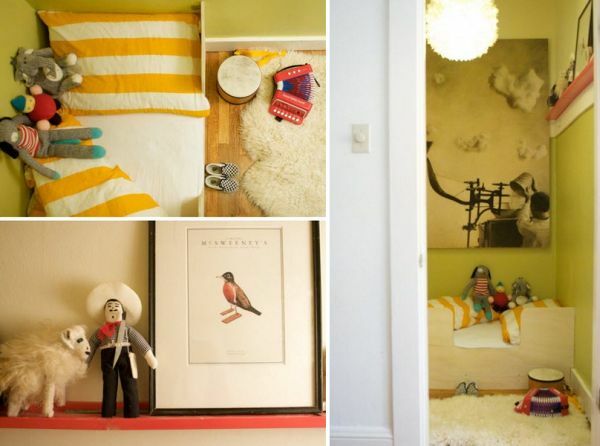 Jordan Ferney and her husband live in one bedroom apartment in San Francisco. 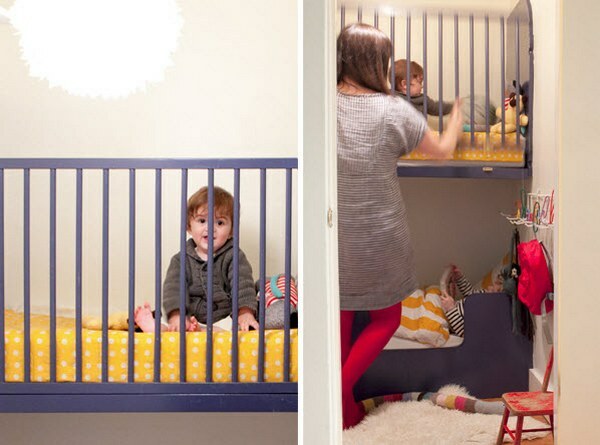 When they had their first baby, a son named Moses, they turned a closet off the living room into a ‘nursery’. 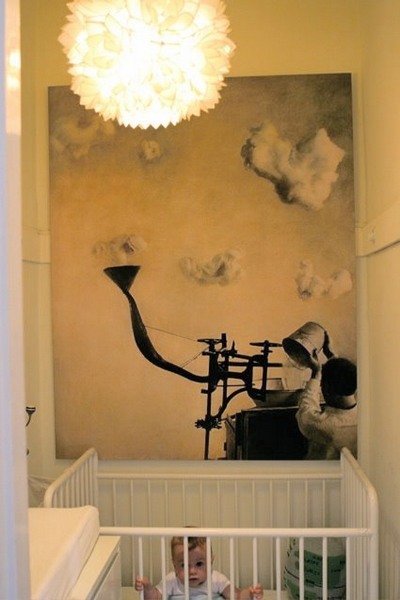 Just wide enough for a cot plus a few stunning details – an amazing sculptural light fitting and an enormous print on the wall – the nursery became a neat, compact and stylish space. When Moses turned two, Ferney’s husband Paul built a toddler bed to replace the cot. 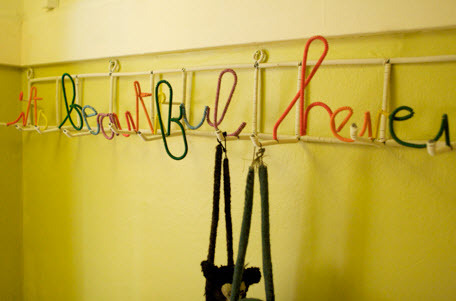 The room got a makeover with a new celery-green colour scheme and a fabulously colourful coat rack. Soon after, baby Roman was born. Joining his brother in the closet, Roman sleeps in a custom built bunk cot with a side that lifts and rolls over the top so that Roman can be taken in and out. While Ferney says she loves small, well-edited spaces, she does not deny that if finances allowed she would prefer a large, sun-drenched nursery for her boys! Find all Ferney’s style notes in her posts at Oh Happy Day – many of the decor pieces she used are available online.